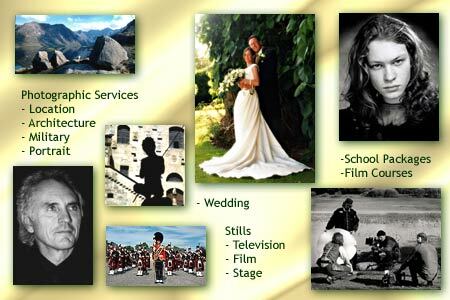 Film Courses by "The Team"
For your special event you need to feel confidence in the skills of your photographer. Photographers-Scotland can give you a 100% guarantee of satisfaction. Wherever and whatever your project -- portrait, wedding, special location, film set, military event, architecture, school groups and portraits -- any kind of indoor or outdoor event -- you can be assured of a first class service. Al Anderson is an Associate of the British Institute of Professional Photographers. A freelance professional still and film photographer, Al Anderson has his own photographic company, Locheil Photographics, which he runs with his partner -- art director and set designer Frances McMillan. All the images on these online photograph portfolios were taken by Al. Film courses are run by a talented team of film makers in a fun and entertaining setting perfect for activity holidays, educational holidays, corporate team-building, convention entertainment for spouses, and incentive outings. Skills taught on the courses include: production, directing, acting, camera, lighting, sound, costume, make-up. Browse the pages of these portfolios to view a wide variety of photographic subjects: from breathtaking landscape views to photo-journalistic wedding scenes. As a commercial photographer, Al Anderson has for 20 years photographed celebrities, film sets, hotels, restaurants, military units, architecturally important buildings, and a wide variety of subjects for commercial publications. His many clients are located throughout the UK and he has carried out location work throughout Europe. Based in central Scotland Al is ideally placed to travel anywhere in the UK and abroad. As a school photographer, Al takes great care to catch that special smile or glance which takes school photographs out of the ordinary. Al has also kept up-to-date with the growth in digital technology. Your photographs can be delivered on CD as well as on film.